A few years ago, a video was uploaded to YouTube entitled "Gap Yah" - a parody of twenty-somethings going abroad to 'find themselves' and experience 'spiritual culture', usually in a bottle of booze and a bag of weed. 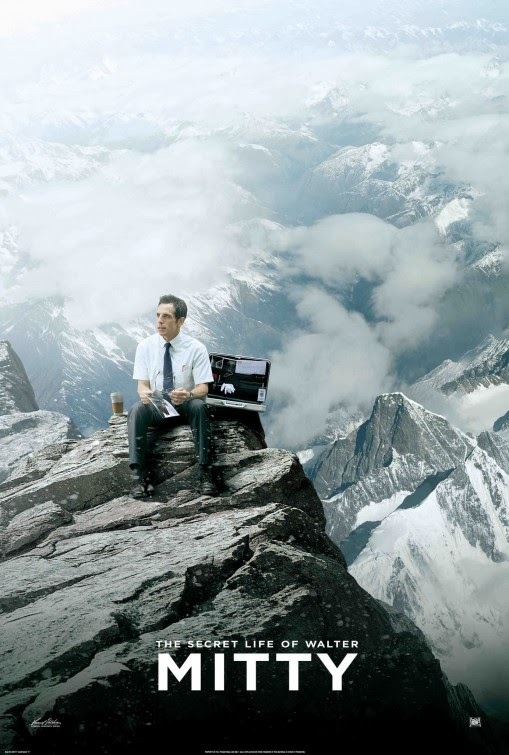 The Secret Life Of Walter Mitty is the cinematic equivalent - it's all very well hearing these stories, but it's much more fun for the people who experienced them than the audience. Walter Mitty sets out to be a life-affirming and charming story of one man's spiritual journey to enlightenment - "the new Forrest Gump" it's been marketed as. Our protagonist Walter (Ben Stiller) lives in New York City, working for (where else?) Life Magazine as a Negative Asset Manager (i.e he's in charge of the pictures). When one negative goes astray putting his monotonous employment in jeopardy, he embarks on a spontaneous and unlikely adventure to find the mysterious photographer (Sean Penn) that takes him across the world - from battling sharks in a freezing ocean, to surviving a volcanic eruption and climbing the Himalayas. Not only does he learn to live life to the full and take chances, it provides plenty of material for his eHarmony page and, eventually, leads him to the woman of his dreams (Kristen Wiig). It's as overblown, patronising and schmaltzy as you can imagine, with an ending that falls too easily into cliché, all accompanied by an epic folky soundtrack performed predominantly by José González. As you'd expect from Stiller, however, the film doesn't take itself too seriously. Walter is prone to "zoning out" and daydreaming, leading to a number of ridiculous and humorous vignettes taking place in his mind. It's also great to see Stiller and Wiig in more dramatic roles, whilst still maintaining their natural comic timing. As the film goes on, however, these daydreams diminish as the film descends into one long fantasy. It's trying to be life-affirming, but lacks any sense of realism - for one, who has phone signal and battery at the top of the Himalayas? On the positive side, the cinematography features some stunningly beautiful landscapes, as if we're watching Life Magazine itself come to life (pun not intended). It might not be a believable story, but the film does make you want to travel the world. In that sense, it's done its job.